"I make this mole at a five star restaurant. It has lots of flavor and it is a little bit spicy. I use it on quail, but you can use it on what ever you like." Preheat the oven broiler. Place the tomatoes and jalapeno peppers on a baking sheet, and broil about 5 minutes, turning once, until they have begun to scorch on all sides. Remove from heat. Transfer the peppers to a bowl, and cover tightly with plastic wrap until cooled, about 15 minutes. Slip the skins off the peppers, slit peppers open, and remove the seeds. 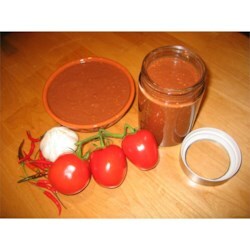 In a blender or food processor, blend the tomatoes, peppers, walnuts, sesame seeds, raisins, chocolate, and garlic. Heat a skillet sprayed with cooking spray over medium high heat. Cook and stir the blended mixture in the skillet until heated through. Return the mixture to the blender. Blend in enough of the vegetable stock to make a slightly thick sauce. Cool, and store in the refrigerator until ready to use. Smells bad, tastes bad, and even looks worse!